I love the Edinburgh Book Festival. I have been a regular attendee since I was a kid – I remember one particularly hot summer’s day, queuing for hours in the middle of Charlotte Square to have a bundle of books signed by Terry Pratchett, and almost being able to see his head turn redder as the day went on. Thankfully there are now tents for the signings, two brilliant bookshops, and so many fantastic events that it’s always a shame when money dictates how few I can attend. I love the EIBF so much that I actually worked there in 2009 – ended up spending approximately one week’s worth of my wages back in the shop I staffed. Margaret Atwood and Neil Gaiman in conversation – interesting but ultimately not that successful, as they both had so much to say and one kind of took over. A Chair would have been good for this. Publishing today talk – panel from Scottish Society of Authors and one publisher talking about the pros and cons of self-publishing. ‘Horror and Weirdness, a Scottish Peculiarity’ – a panel including Margaret Atwood and Ian Rankin discussed Scottish horror and supernatural fiction. Patrick Ness – the golden ticket event for me. I’m a big fan of Ness, and found this insightful and amusing. 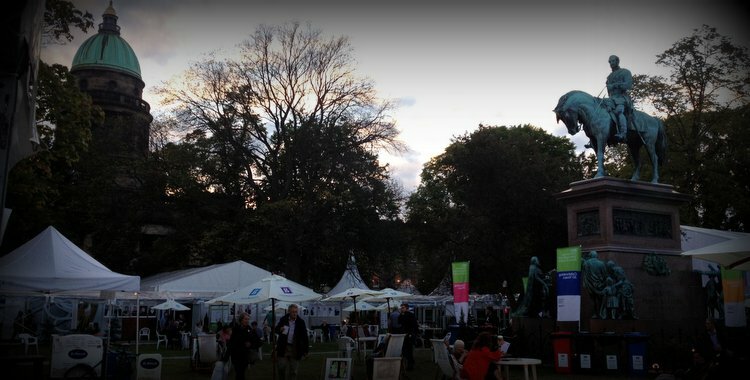 Charlotte Square is normally closed off to locals (unless they live right beside it) so the Book Festival is also a nice opportunity to relax with a pint and some friends in an otherwise closed location. I’m already looking forward to the Book Festival in 2014.